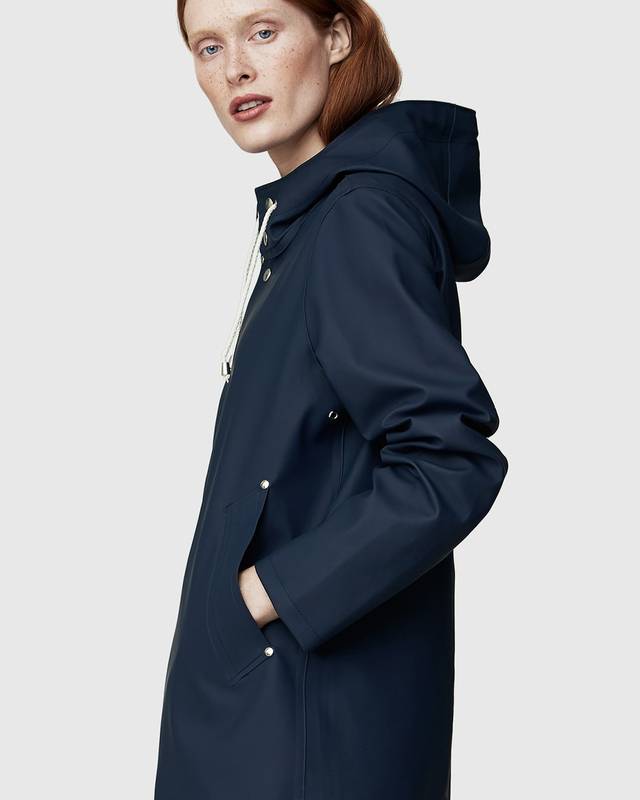 I chose handmade ‘Stockholm’ raincoat in navy blue. Image courtesy of Stutterheim. Two decades without a raincoat – I cannot believe I survived, even though you can hardly call that an achievement. Looking for a raincoat last fall I learned there are basically two types available. Thin raincoats weigh nothing. Have you tried them? When it rains, they are like an umbrella wrapped around you, that is, a waterproof layer of clothing. The thicker raincoats feel more like a real coat, an armor that will protect you from heavy rain and wind. They feel heavier on, obviously, but you are also completely weather proofed. You just wear a sweater or a light down jacket underneath and you will stay warm and dry. As the weather in the north can be pretty extreme from November to April, I went for the latter, a thick and hard-wearing raincoat by Stutterheim. Handmade of rubberised cotton with double welded seams, the Stockholm raincoat has a nice clean fit. You can wear a chunky sweater underneath and still keep the silhouette somewhat streamlined. I found my raincoat in Urban A in Helsinki. The Line also carries a selection, and Stutterheim online shop offers free worldwide shipping.